At a time when supporting Israel is sometimes unpopular, Greece stepped forward to renew bonds with its ally across the Mediterranean Sea. In July of 2011, Greece prohibited a flotilla of protest ships from leaving port which was destined to test the embargo imposed on the Gaza strip by the Israeli government. Greece has banned all ships heading to Gaza and Israel has blocked any effort to breach its sea blockade of, which it imposed on the Palestinian territory after the militant and political group Hamas took control of it in 2007. The United States, European Union, Canada and Israel consider Hamas a terrorist group. Deputy Foreign Minister of Greece Dimitris Dollis with meeting organizer John Catsimatidis and Deputy Foreign Minister of Israel Danny Ayalon. Shortly after the incident, leaders of the New York Jewish community, Rabbi Joseph Potasnik, Executive Vice President New York Board of Rabbis and Howard Teich, attorney and past President of the American Jewish Council Met Region, approached John Catsimatidis, a New York Greek American businessman, Chairman of the Red Apple Group, and the National Coordinator for Religious Freedom of the Greek Orthodox Church of America. The leaders asked Mr. Catsimatidis if he could help arrange a meeting between diplomats just as a visible affirmation of friendship and mutual support between the two Countries. 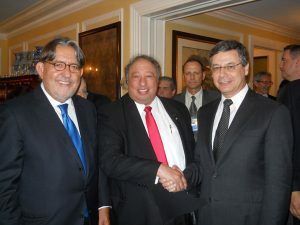 That meeting took place, yesterday afternoon, September 20, 2011 at the Greek Consulate in New York City. Amidst the formal comfort of the Consulate, with its impressive art collection from around the world, host Consul General of Greece in America Aghi Balta welcomed her counterpart Israel Consul General of Israel in America Ido Aharoni and a large delegation of Greek American and Israeli leaders. 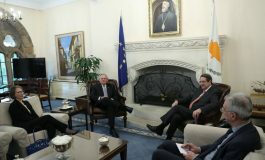 Deputy Foreign Minister of Greece Dimitris Dollis welcomed the Deputy Foreign Minister of Israel Danny Ayalon and the two spoke of their mutual admiration and working relationship. Minister Dollis noted that during WWII, the Jewish population of Greece was nearly wiped out. 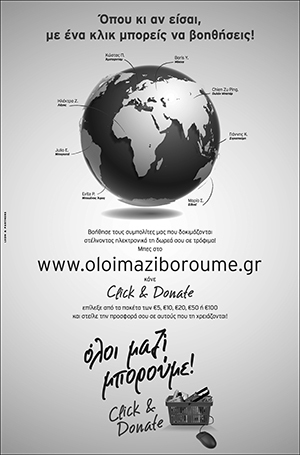 Nearly 90% of Greek Jews were forced into death camps or outright murdered by the Nazi’s. After the war, most of the surviving Jews in Greece migrated to the new state of Israel. This too adds to the bonds of these two nations. There have been Jewish enclaves in Greece for 2,000 years, and this meeting of diplomats at the Consulate shed a spot light the strong ties these two ancient, yet modern civilizations share. As the General Assembly of the United Nations opens this week, Palestine is pushing membership in the UN as an independent state which Israel vehemently opposes until all hostilities cease. It will be a week when Israel needs its allies to remain loyal and from the looks of yesterday’s meeting, Greece is solidly in Israel’s corner.